In the beginning of the Matrix, we are introduced to Thomas Anderson as your everyman – living a normal, albeit slightly troubled life. He works in a cubicle by day and is a hacker on the computer by night. Mr. Anderson doesn’t sleep enough and feels something missing in his life but can’t quite put his finger on it until he meets a woman named Trinity. “It’s the question that drives us,” Trinity says.”What is the Matrix?” By answering that query, Thomas Anderson begins his journey down the rabbit hole towards ciphering the Matrix and becoming The One. Much like Thomas Anderson, we adults in our real world also struggle to find meaning in our lives occasionally. What are we here for? What is the meaning of all this (life)? Am I doing what I want or should I be doing something else? Am I happy? What do I need to change? How do I change? Questions such as these become ubiquitous at various points in all our lives. We’ve even given the really defining moments names like Teenage angst; Quarter-life crisis; Mid-life crisis; College; Parenthood; etc. etc. etc. The commonality in all these situations for us all, no matter when we experience them, is this – each of these moments point to a struggle for identity. These identity crises are periods laden with dramatic self doubt – wherein we glimpse the passing of our lives through the rearview mirror and yet don’t know the road ahead. You question who you are. You fear facing an uncertain future. You yearn to find yourself. You feel like something is missing in your life yet you can’t quite put your finger on it…. In watching Thomas Anderson awaken and grow into the character known as Neo, we see that he is gradually awakened to the world of possibilities. At first, he can’t even learn kung-fu, much less fly, stop a speeding bullet, or leap a mountain in a single bound. His was a transformation that did not happen until he decided to see things from a different point of view. He had to let go of Thomas Anderson and be Neo. For most adults in the real world, we struggle to change because of the same reason Morpheus quotes above. We like to say we are set in our ways but what we really mean is that we are discomforted by what is unfamiliar. We fear the unknown and cling to the perceived safety of sticking to what we know. Even if this sometimes means staying at a job we hate for bosses we despise or staying in unhappy, destructive relationships, we humans would typically rather stay rooted than make a decision that would have us lose sight of shore and sail us toward the great unknown. How did Thomas Anderson make the transformation to becoming a fully-badass Neo? For starters, he went to the Oracle – the one who knew past, present and future. Yet once he was there, she did not tell him what he needed to do, where he needed to be, or what was ultimately going to happen. She did not shape the future for him, she merely opened the way. She simply told him what he needed to hear so he could chart his own course. The Oracle: I’d ask you to sit down, but you’re not going to anyway. And don’t worry about the vase. The Oracle: I said don’t worry about it. I’ll get one of my kids to fix it. The Oracle: What’s really going to bake your noodle later on is, would you still have broken it if I hadn’t said anything. Much like Thomas Anderson, we in the real world look for our own oracles to help give meaning to our lives in so many different ways. For some, this can be as simple as reading books on self-help and philosophy for guidance. Others go a little further and incorporate a mentor / role model into their daily lives. Many go the route of listening to gurus like Zig Ziglar or Tony Robbins for regular motivation. More utilize organized religion or the Joel Osteen’s of the world as their guiding light. Heck I’ve even had friends go to for-profit seminars that incorporate different aspects of all these aforementioned methods as a crash course on unraveling life’s purpose. Now keep in mind I’m not knocking any of these. Sincerely, to each their own in terms of what gets them through the days. Just like Neo benefited from visiting the Oracle, everyone can derive benefit from their own personal muse as long as their guiding light isn’t to the detriment of others and doesn’t run out when the bottle is empty or when the money runs dry. But what’s even more important than the inspiration of a muse is reaching the stage of self-awareness. This is the point where you can separate your thoughts of the moment, positive or negative, from who you actually are as a person. Without self awareness, you are a slave to these thoughts. Worse yet you are a likely candidate to be a slave to the thoughts of others – a talking head, serving no purpose of your own other than being a very good parrot repeating what you hear. Critical thinking need not apply. Point being, Neo would never have become Neo unless he let go of Thomas Anderson. He would have never grown into the person he needed to be unless he became self aware despite the best efforts of his captors. Without freeing his mind and realizing the power of his own volition, Neo would have remained a tool, his energy used to feed the imaginary world around him. Let me point you to the pivotal moment where Neo begins to wake up for real and see infinite possibilities for himself and what he could do. Spoon boy: Do not try and bend the spoon. That’s impossible. Instead only try to realize the truth. 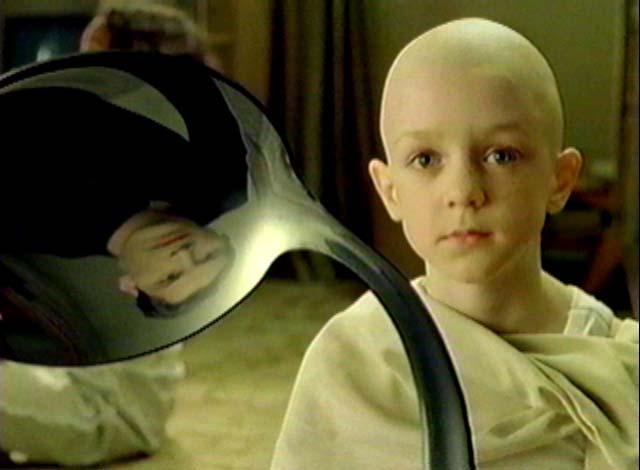 Spoon boy: Then you’ll see that it is not the spoon that bends, it is only yourself. This was the most important lesson for Neo. 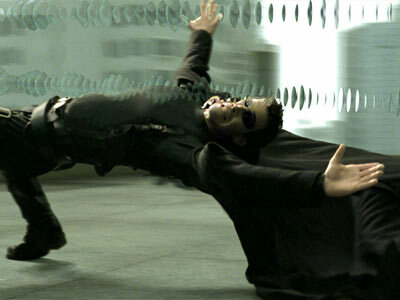 It helped him realize that manipulating the Matrix wasn’t about focusing on objects or trying to force them to chance. His epiphany was seeing that the constraints on what he could accomplish (and the spoon itself) existed nowhere but his own mind. In order for him to have any measure of control on the world around him, he had to look inward. It was all in his head after all. Eureka! That’s the solution to life’s moments of crisis and self-doubt, anxiety, and uncertainty. It’s in realizing that we must look inward to accomplish our goals. We can’t change the obstacles, people, or world around us. We shouldn’t even blame others or the world itself, for that bears no factor in moving forward. We can only exact control over that which is in our own dominion. The key to the future is all in our heads. So the next time you find yourself in a rough situation, just remember that there is no magic red pill solution. Sometimes you have to let go of your own personal dogma, stop clinging to what is familiar in order to move forward. Also, heed that you can use the guide of oracles but they can’t ever do the life-changing for you. And most importantly, realize that there is no spoon.